Wonkette said it best today, “Bernie Sanders has approximately zero percent chance of being elected president.” And yet I’m excited about him entering the race for the Democratic nomination for president, probably tomorrow. Bernie will fractionally do to Hillary what the right wing of the Republican Party did to Mitt Romney… in the opposite direction. Even though Sanders isn’t particularly well known outside Vermont (where he won his last Senatorial election with 71% of the vote, even against candidates from the Republicans, Marijuana Party and a guy named named Pete Moss!) his ideas are. He speaks to labor and the forgotten middle class. He rails against the moneyed and powerful (actually the powerfully moneyed). Without Sanders in the race, Hillary Clinton could stake out her territory by being a centrist or even right-of-centrist candidate. Mitt Romney was a reasonably middle-of-the-road governor in Massachusetts. He was for a lot of things there that he was forced to run against as the Republican candidate for president. “What we have seen is that while the average person is working longer hours for lower wages, we have seen a huge increase in income and wealth inequality, which is now reaching obscene levels,” Sanders told the AP. I needed a piece of camera gear for an upcoming trip. After checking around, I decided to order a ‘grey market’ version. Grey market means it isn’t intended for sale in the US. It’s not covered by a US warranty. That’s the only difference–except price. I saved around 35%. 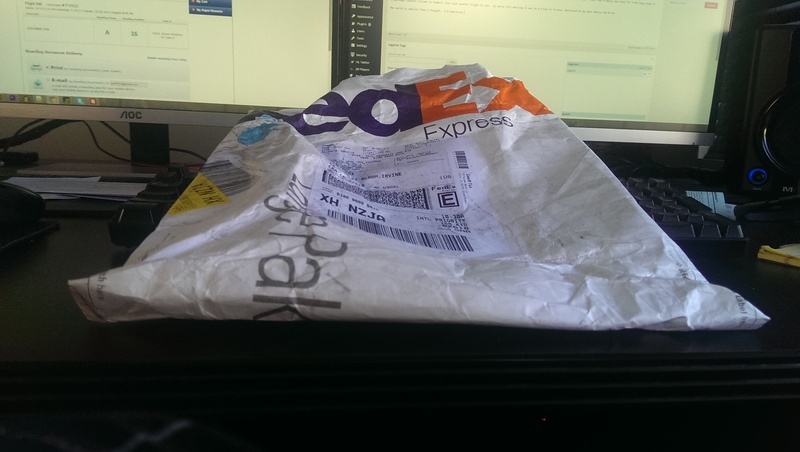 My purchase on EBay from a ‘store’ in Hong Kong was made early Friday afternoon in SoCal. Eight hours later it was out-the-door and on its way. FedEx has a daily non-stop 747 from Hong Kong to Memphis, which is how it probably travelled. My package cleared customs in Memphis then took another flight to LAX. By early this morning it was on a truck in Irvine, delivered to my door before 10:30 AM. The world is smaller than I thought. I’m impressed. The competition’s tough. Baby, that’s a pity. How will McDonalds go about building its profit? Will it raise its prices? This is what the fast food industry has screamed any time the subject of raising wages comes up. My guess is price raising is the last thing they’ll do. And, in spite of their kvetching, it would also be among the last things they’d do if forced to pay a more reasonable wage to the McDonalds crew. I get it. Underpaying employees is fabulously profitable. It’s also reprehensible. Let’s see how McDonalds goes about dealing with this crisis. It will tell us a lot about their honesty on the wage front. McDonalds made over a billion dollars in this past quarter on revenue of seven billion. My dad and I were on the phone yesterday. He told me he just ordered corn flakes via Amazon. A click in the evening brought the flakes 36 hours later. “How do they do it,” he asked? My mom and dad, now living comfortably near my sister and her family in frigid Wisconsin, aren’t very mobile. Grocery shopping is tough. We’re big Amazon users here too. I’m looking around my office at loads of items delivered to me. I’ve ordered on-line when I could have just gone to Home Depot, under five minutes away. Is this a good thing? Over the short term it’s great. I get what I want with less hassle and for what’s usually the best price. Amazon figured out how to get things to me fast using a variety of delivery services. It’s a data driven company. There’s a method to their madness, but no two packages come via the same route. Over the long run I’m much less convinced all of this is a good thing! Staples announced they’re closing 300 stores in the US. Radio Shack is lopping off over a thousand. Retail’s in trouble. Malls are in trouble. Even Walmart is worried. Amazon is trying to hide in the corner, softly whistling. At the same time, Amazon’s become adept at extracting favorable tax rates and incentives. A Google search for “tax incentive amazon” shows a half dozen states considering or already offering large sums of money to Amazon. Everything I buy online I don’t buy in a store. Amazon fills the gap with fewer employees earning less money. I’m not paying today. I’m paying tomorrow. The jobless require assistance. It’s not the workers fault. 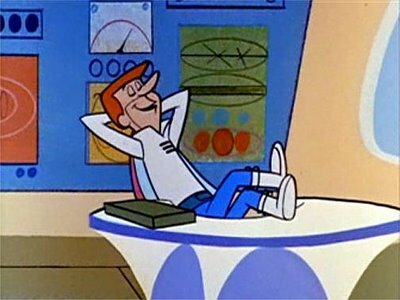 If the Jetsons had properly predicted the future, where George comes to work and immediately puts his feet up on his desk, we’d be fine. I grew up with that fantasy. But labor saving hasn’t meant making life easier for labor. The effect has been quite the opposite. The convenience offered by buying online is huge. It’s only when you see the whole picture, it becomes suspect. These are complex choices. I’m not rushing to a decision. It’s confusing. Helaine and I drove to Hollywood last night. Helaine had some goodies for Stef. It’s a 55 mile drive. An hour and a half last night. LA traffic is as advertised. Stef met us after work. She’s been to the Golden Globes, SAG and Grammys. She’ll be on the Red Carpet at the Oscars too. Stef’s part of the team that produces the ‘pre-game’ and ‘post-game’ shows on E!. They’ll be live seven hours at the Oscars. OK, I’m her father. I’m biased. It sounds like a pretty cool job. I’m especially glad she’s involved in live TV. It’s a rush when you’re on and there’s no turning back. I tried to explain the feeling before she started. Alas, you can’t properly describe an experience. We brought Doppler along, which limits where we can go. Who cares? She’s an excellent traveler. We ended up at Pink’s on La Brea. It’s a hot dog stand, built in 1946, still rocking it’s 1946 style. Pink’s is a reflection of LA’s early adoption of cars versus public transport. You could drive up, get out of your car and get a dog! I had the “HUELL HOWSER DOG – 2 hot dogs in ONE bun – mustard, chili, cheese & onions.” Huell was a well known TV personality whose segments on LA’s quirky native culture are still played, long after his death. I also had a Dr. Brown’s Cherry. That brings me back to Flushing, as a kid. The taste hasn’t changed. It was magical. Pink’s no Glenwood! Will someone please tell Rob I said that. Our drive home was much faster–a little less than an hour. We’re very lucky to live so close to Stef. It’s a trip we enjoy taking. 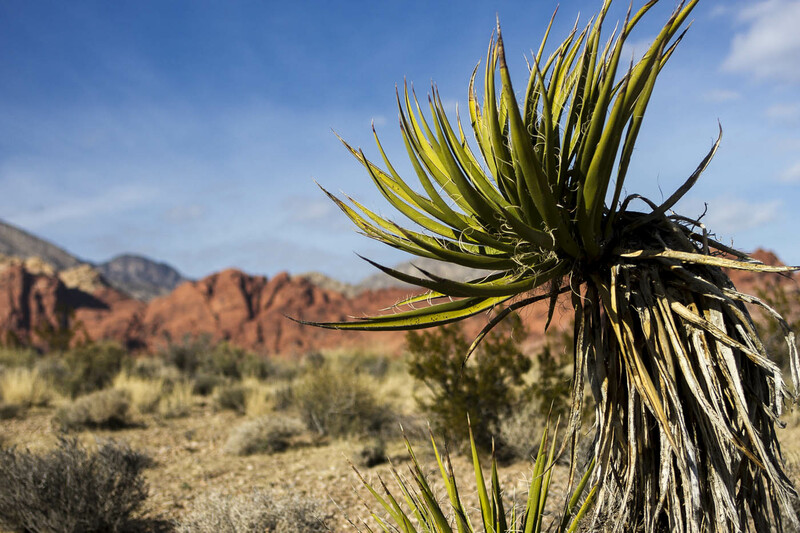 Most people think of Las Vegas and stop at casinos. That’s easy to do. They’re built as one-stop shops to separate you and your money. Luckily, there’s a lot more going on here in the desert. 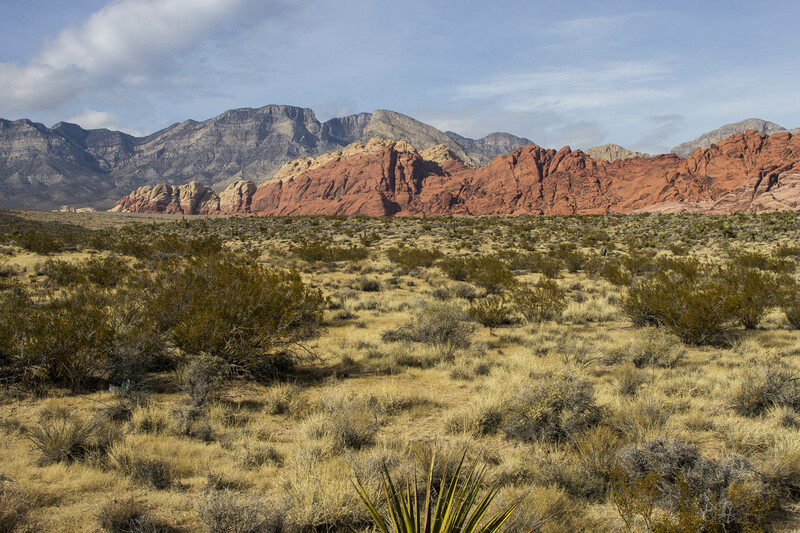 Just west of Las Vegas is Red Rock Canyon. 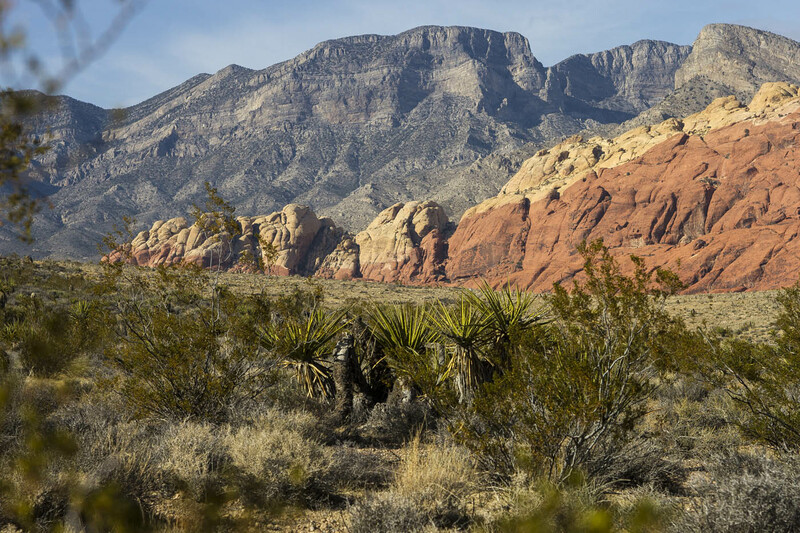 Mostly, it’s undisturbed desert with great views. With temperatures in the upper 50s today was perfect for a walk. We chose a trail with little vertical climbing and started out. We’re actually not sure how long we were on the trail before we lost it. There were still plenty of footprints in the dry river wash we followed and we didn’t go too far astray. We just lost the actual trail! My Cousin Michael was quick to note, no birds. 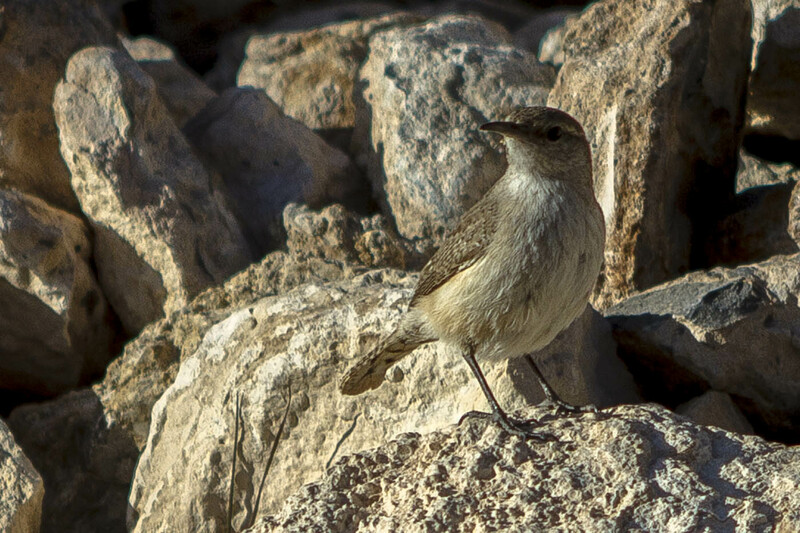 We did see one tiny gray bird Mother Nature has made nearly indistinguishable from the rocks it lands on. That was it. One bird… and we were looking. It’s also interesting to see the colors of the plants. 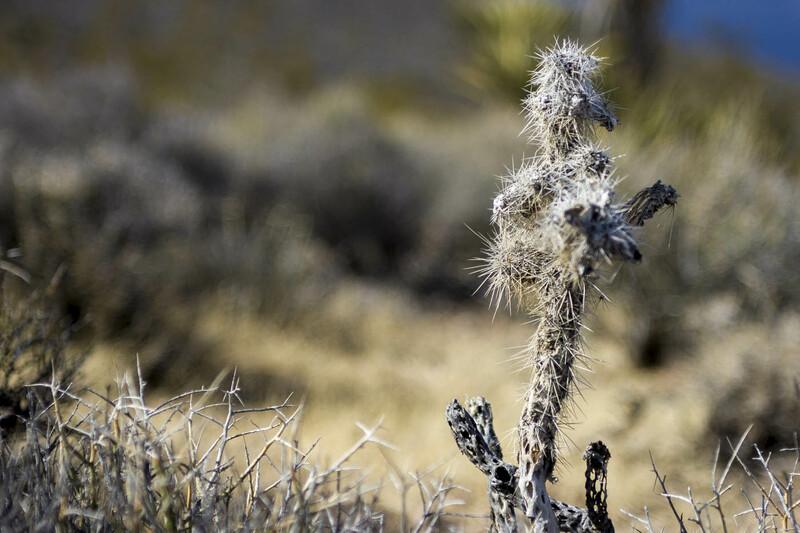 Many of the living desert species have colors normally only seen once a plant has died! If I Complained About Our Weather Would You Listen? From a human being day-to-day standpoint, it would seem we moved to an idyllic meteorological utopia. The sun shines nearly every day. It’s hardly ever humid, nor hot, nor cold. Since we arrived in late June it’s been totally dry every day but six! We really need rain. More importantly, the Sierras need snow! We’re already in a drought with no sign it’s abating. 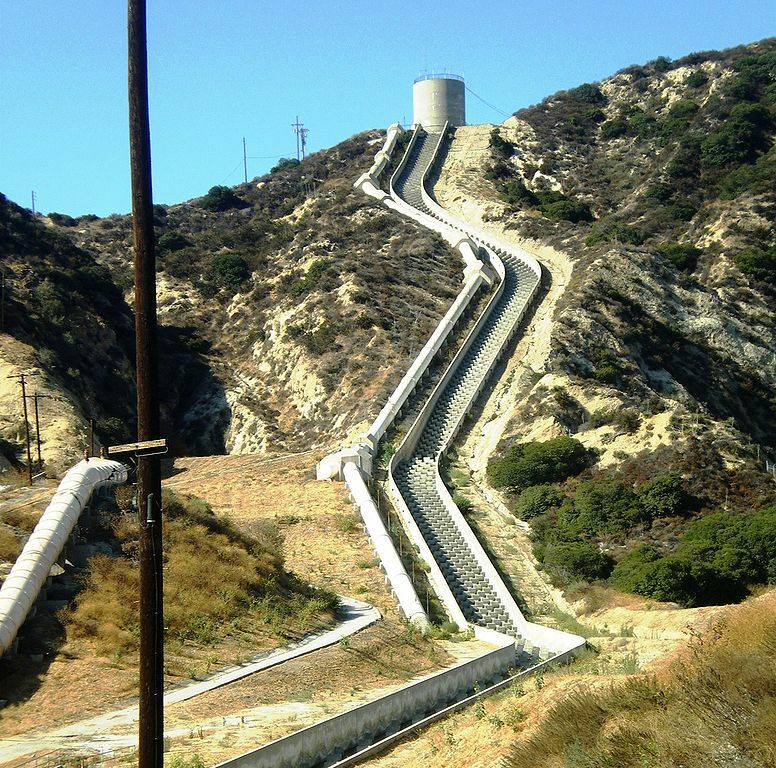 Most of Southern California uses water from the Sierra Mountains. How it gets here is an engineering marvel just over 100 years old. The water takes a 230 mile gravity powered trip to the LA area. Right now the Northern Sierras have 7% of their expected snowpack. The rest of the mountains range from 15 to 25% of normal. That’s exceptionally dry. 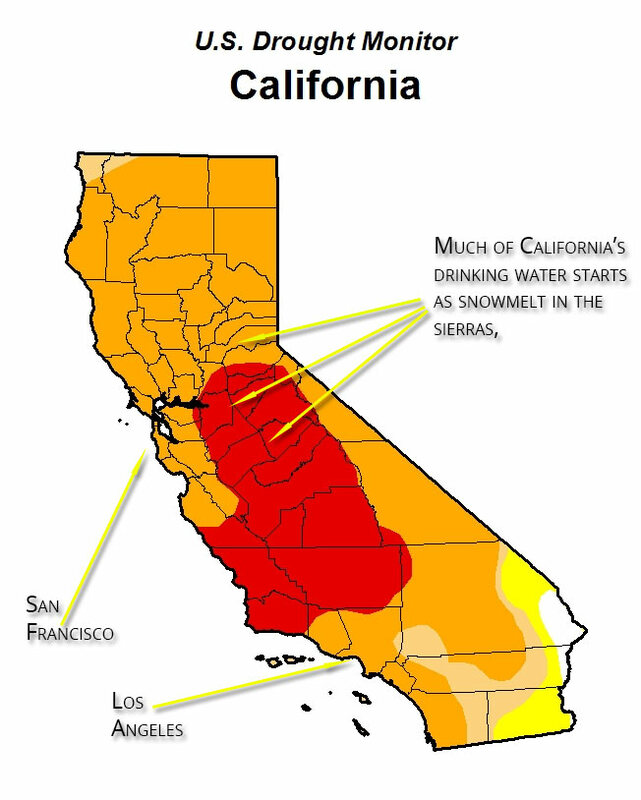 Snowpack is a great water source. It’s released slowly as temperatures rise. Less wasted runoff. It is mainly dependable, but as this year shows, not totally. Not only does LA and much of SoCal depend on this distant source¹, so does California’s Central Valley. That affects us all, even outside the West. There’s also the enhanced fire danger when it’s this dry. Fire season should be over in January, but Red Flag Warnings will likely go up late this weekend as the wind blows from the east–Santa Ana winds. I relish these beautifully salubrious winter days, but I hope we get some rain soon and the Sierras get blanketed in snow. It’s really needed. There will be little sympathy from those reading this while shivering. 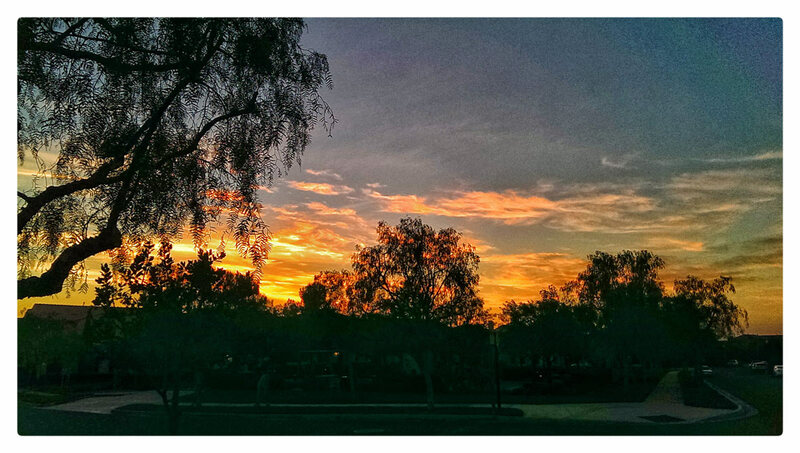 ¹ – We use mountain water too, but Irvine has local sources for the vast majority of our needs. Shhh. Don’t tell. Author Geoff FoxPosted on January 10, 2014 December 16, 2016 Categories UncategorizedTags California, Central Valley, food products, Hydrology, Physical geography, Shhh, Sierra Nevada, Snow, Southern California, United States, Water4 Comments on If I Complained About Our Weather Would You Listen? The Philadelphia Eagles play the Minnesota Vikings tomorrow night. The game was originally scheduled for Sunday night at 8:30 PM. At game time nearby Philadelphia International reported visibility of 3/4 mile in moderate snow and blowing snow. The wind was out of the northwest at 21 mph. It was 25&#176. Under anyone’s sense of the word it was cold… brutally cold in Philadelphia. It was unpleasant to be outside. For those improperly prepared it was dangerous! The game shouldn’t have been postponed! This is football; football’s played in bad weather. I think the fans would have gotten there, the subways work and the major arteries are still open, and other fans would have stayed home – but you play football regardless of the weather. He’s right even though the current Mayor had declared a State of Emergency in the city. If I was broadcasting in Philadelphia I would have encouraged viewers to stay home. People would have anyway! The game would have still been available on TV staffed by a crew ready for bad winter weather. I’m an Eagles fan. This delay probably benefits the Eagles. It makes no difference. It’s unfair to the other NFL teams who’ve had to suffer through pass deflecting winds, frozen fields and limited visibility. It’s 2010. Gay Americans are a mainstream part of our society. Haven’t the senators watched cable recently? I am incredibly disappointed and angered the repeal of “Don’t Ask. Don’t Tell” failed in the Senate. The defeat was procedural as ‘only’ 57 senators voted to bring the bill forward. That meant a Republican filibuster was certain. The minority ruled! DADT in general and today’s debacle in particular will be looked upon as an embarrassing moment in our history. We ought to be ashamed of ourselves. Who The Hell Is Joe Wong? Yet as soon as he began to speak the audience roared–and this is a very tough crowd! I attended the Radio & Television Correspondents Dinner last night at the DC Convention Center. Joe Biden was the main speaker. A couple of funny lines in the beginning of his speech. Also, look for Joe Wong, a comedian, who wrapped up the evening. He has a final line about global warming. I thought of you. First, I’m impressed Farrell was at the dinner. He is the International Man of Mystery&#153, but he’s never been a correspondent. At least he hasn’t been in the nearly thirty years I know him¹! Second, who the hell is Joe Wong? Am I that far behind on comedians? I went to the C-SPAN site to look at the video. That’s when I found out this broadcast wasn’t even on ‘real’ C-SPAN, but C-SPAN 2–The Deuce. Joe was introduced as having been on Letterman and Ellen Degeneres. That’s OK on a resume, but not great. He walked to the podium. If you were looking for a comedian he is not what you would have been looking for! Yet as soon as he began to speak the audience roared–and this is a very tough crowd! Joe Wong is Chinese born, Rice educated. His accent is strong. His observations of our, now his, culture are dead on. This was a great surprise–a wonderful surprise. I am now a Joe Wong fan. Here’s the video from C-SPAN 2. ¹ – I met Farrell on the phone about 15 minutes before I knocked over and then met Helaine. That was a VERY good day! 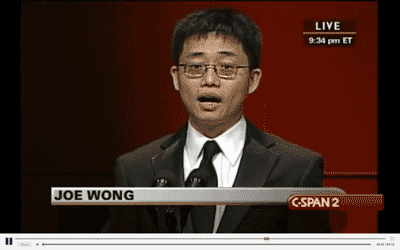 Author Geoff FoxPosted on March 19, 2010 March 19, 2010 Categories UncategorizedTags C-SPAN, comedian, Ellen Degeneres, Farrell, Joe Biden, Joe Wong, Television, Television in the United States, United States10 Comments on Who The Hell Is Joe Wong? Is Buck Hollywood Proof Of My Hipness? Seriously, you don’t know Buck Hollywood? What are you, my age? 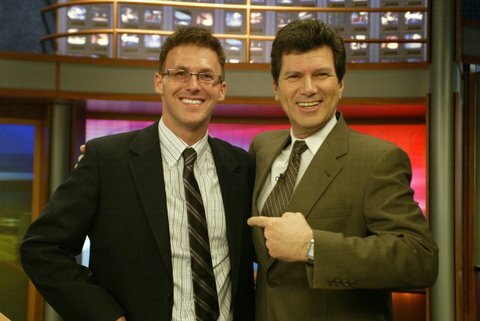 Michael Buckley was in the station this afternoon. Until recently he was a worker bee for Live Nation the concert promoter. No more. Michael Buckley is Buck Hollywood. All he needed was a $2,000 Canon camera, a $6 piece of fabric for a backdrop and a pair of work lights from Home Depot. Mr. Buckley is an example of the Internet’s democratizing effect on publishing. Sites like YouTube allow anyone with a high-speed connection to find a fan following, simply by posting material and promoting it online. Of course The New York Times only counts so much. My 22 year old daughter is probably a better authority. She went slightly delirious and totally breathless when Michael sent me a message via Twitter. I have 806 followers. He has (seriously–no BS) 478,829! 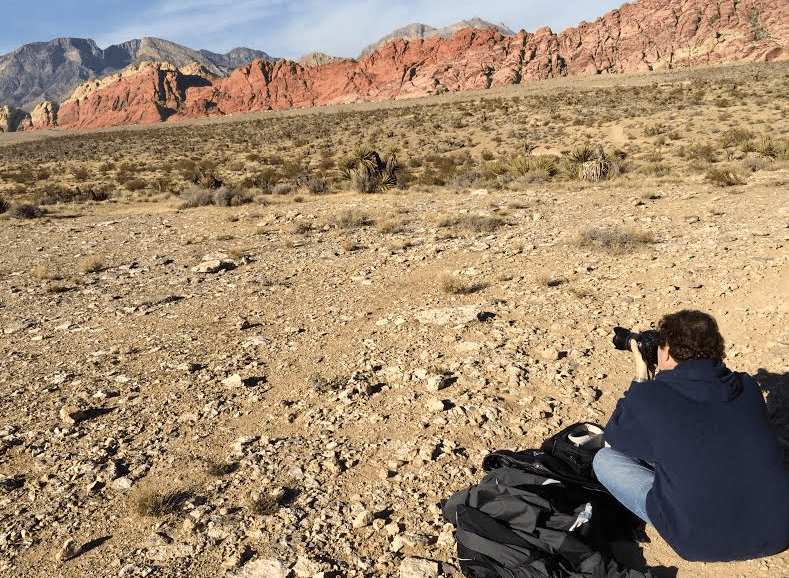 There is no secret recipe to what Michael does in front of the camera. He is just a more frenetic, more amplified, more flamboyant version of himself. Think ‘reducing’ a gravy to enhance its flavor. In online video that really works! Michael Buckley’s product is Michael Buckley, though a more concentrated version than you’ll meet in real life. We, the denizens of a rapidly shrinking TV universe, marvel at his ability to make a living without worrying about whatever the boss is worrying about. I think he looks at me as a historical artifact of television. I see him as the future of video. We’re both happily impressed. Author Geoff FoxPosted on March 17, 2010 March 17, 2010 Categories UncategorizedTags Entertainment/Culture, Michael Buckley, the New York Times, The New York Times Co, United States, World Wide Web, YouTube Inc2 Comments on Is Buck Hollywood Proof Of My Hipness? I am looking forward to seeing her, but not her reaction to the snow she’ll be seeing! I’m on FlightAware tracking Helaine’s flight across the country. She’s just left Colorado and now over Kansas. This is how Thomas Jefferson followed Lewis and Clark, right? Recently I’ve come to an Internet epiphany. Don’t worry about the word. I looked it up to make sure I was using it correctly. An epiphany is a moment of sudden insight or understanding. I’d always thought as our use of the Internet progressed we’d need beefier hardware (aka more powerful computers) to get the job done. And certainly, that’s what the last few decades have shown us. Better computing experiences followed better hardware. Cloud computing means data travels the Internet and gets processed remotely. A Google search takes place in the cloud. My Gmail account lives there. So does the real work that enables the Dragon Dictation app for my iPhone. I downloaded the Siri app this weekend. That doesn’t fly without the cloud either. This new era of cloud computing is only available because data pipes are fat. In a few years I may look back at the last sentence as a naive observation, but today we’ve got many multiples of what we had a few years ago. Most of us have all the bandwidth we think we need&#185. When bandwidth and cloud computing are heavily involved the power of user hardware becomes less critical. Tablet computing like the iPad or tiny netbooks with weak processors survive because there’s less for them to do to get the job done. Most of the job is accomplished in the cloud. In light of this Wednesday morning’s announcement from Google becomes strikingly important. That much bandwidth and speed means cloud computing can lift even more weight while the user hardware becomes less critical. Mass media has been turned upside down within the last decade by advances in computing. Which sector will pay the price now? &#185 – In reality bandwidth is like closet space. There’s never enough. The public trust is not easily obtained nor should it be taken lightly. Toyota has been behind on this story at every step. It’s not going away. Oh Toyota. You are this close to becoming a business school teaching lesson. You are this close to becoming Bon Vivant Vichyssoise! Never heard of Bon Vivant? Read on. On an early July day in 1971 when it was too hot to cook, a couple in Westchester County, N.Y., sat down to a meal of Bon Vivant vichyssoise, a soup often served chilled (and in this case, straight from the can). The soup tasted funny, so they didn’t finish it; within hours he was dead and she was paralyzed from botulism poisoning. F.D.A. investigators found five other cans of vichyssoise from the same batch of 6,444 that were also tainted with botulism, and spot checks of other products raised questions about the company’s processing practices, so the agency shut down the plant and told the company to recall all its soups. Bon Vivant tried to fight the recall, calling it an overreaction to a highly isolated problem, but it soon became obvious that few consumers would touch anything with Bon Vivant on the label. And because it was known that the company manufactured store brands as well as its own, people started to be suspicious of every kind of canned soup on the shelf. Bon Vivant filed for bankruptcy within a month. Instead of getting ahead of the story Bon Vivant pushed back. They put their profits and priorities before their customer’s. We tend not to like that from those who feed us and from whom we expect scrupulous attention to safety. Nearly seventy years of soup making and Bon Vivant was gone within a month! They became the poster child for what not to do in a crisis. Fast forward to 1982. Someone injected cyanide into Tylenol capsules after they were already on the store shelf. What did Johnson and Johnson do? They took responsibility and bore the immediate cost though the sabotage happened out of their reach. Although Johnson & Johnson knew they were not responsible for the tampering of the product, they assumed responsibility by ensuring public safety first and recalled all of their capsules from the market. In fact, in February of 1986, when a woman was reported dead from cyanide poisoning in Tylenol capsules, Johnson & Johnson permanently removed all of the capsules from the market. You don’t think twice about taking Tylenol today, do you? I am a Toyota guy. My first new car was a 1970 Toyota Corona. I or my family have had one for most of the time since then. Helaine and Stef both drive Toyotas today. I have no animus toward Toyota. But seriously, it seems they are following the lead of Bon Vivant and not Johnson and Johnson. I just watched CNN’s Jessica Yellin play a phone conversation with Toyota about her own Prius. Damning. I know GM and Ford are licking their chops hoping for Toyota’s downfall. I’m not sure that would be as good for all of us as it is for them. I am not rooting for Toyota’s failure. Their prior attention to quality has forced the US auto industry to step-it-up over the last few decades. Right now more than Toyota’s cars are speeding down the road out-of-control.